Ahhhhhh the refreshing deliciousness of an Orange Julius! That’s right – after a long day of cruising the mall nothing makes you feel better than some bright sweet citrus and luckily I am 100% natural and 100% sweet! My name is Mr. Orange E Julius but my friends just call me Jules. 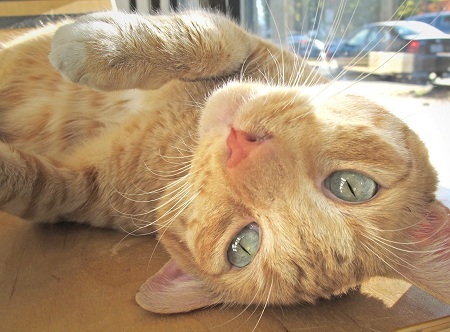 I am an incredibly loving 1 year old orange male tabby who is anything but ordinary. What you think oranges don’t grow in Oregon? Oh well think again Mr. because I am locally grown and looking to plant these roots somewhere for a good long time. I am what some of you humans like to call a ‘dog-cat.’ Apparently this term is used because you simpletons feel that dogs are more loyal or rather more willing to follow you around as if you are about to cure world hunger at any given moment but yes, its true, I do have a nature that some would consider more canine in some respects than feline. I have endless confidence and charisma, I engage everyone who visits the cattery including new kitties, kids and all of our regulars. I am curious, (yes that’s a feline trait we all know the saying) adventurous and ready to entertain you with my loving antics. I am all around a real hoot and trust me, when that sun has been ‘missing’ for a few weeks in a row you will be darn happy you have some fresh squeezed sweetness to get you through the winter! I am fixed, vaccinated and microchipped. My adoption fee is $100. I am living at the Pixie Project cattery so come visit me today!